This is my blog on my experiences in the film and television industry over the last 36 years. Read more about my background or find me on Twitter. Producing requires some imagination. We needed to shoot in an opera house. Can’t afford Lincoln Center. How about Rev. Ike’s former movie palace church in Harlem. The Rev makes a lot of location fees for his church because he kept a lot of the old theater, including the lobby almost intact. By now, I had a very good freelance career going in Chicago. I had also been working steadily with a local Director named Jack T. ‘Bo’ May on commercials. At that same time, I got an interview to be Key 2nd Assistant Director on a feature film. My first feature. Whoa. I wanted it. Although my 3 other buddies who were qualified to be the Key 2nd AD were busy on other shows, the 1st AD decided he wanted to get laid by his cute, brand new PA who he would get in the Guild instead of hiring me. Early lesson that just because you’re the man for the job, doesn’t mean you’re the guy. Above, the crew prepares to shoot on a Chicago rooftop with that fabulous skyline. At the Director’s Elbow series continues. Working on the TV series Chicago Story was a complete eye opener for me. Now I would be prepping with Directors, and my 1st AD on an actual TV series script. The crew was huge. 150 people or more. And because of the airdate schedule, there will be 2 crews shooting simultaneously. The AD’s of both crews must share locations, and actors over an 11 day schedule for each episode. Meaning lots of coordination for AD’s. Unusual for TV, this would be a 90 minute show of Doctors, Lawyers and Cops working and living in Chicago. The Director always has their chair. It’s a sign of their authority as well as their comfort. The AD never sits during the production day. Their position is standing next to the Director and running the set. At the Director’s elbow. 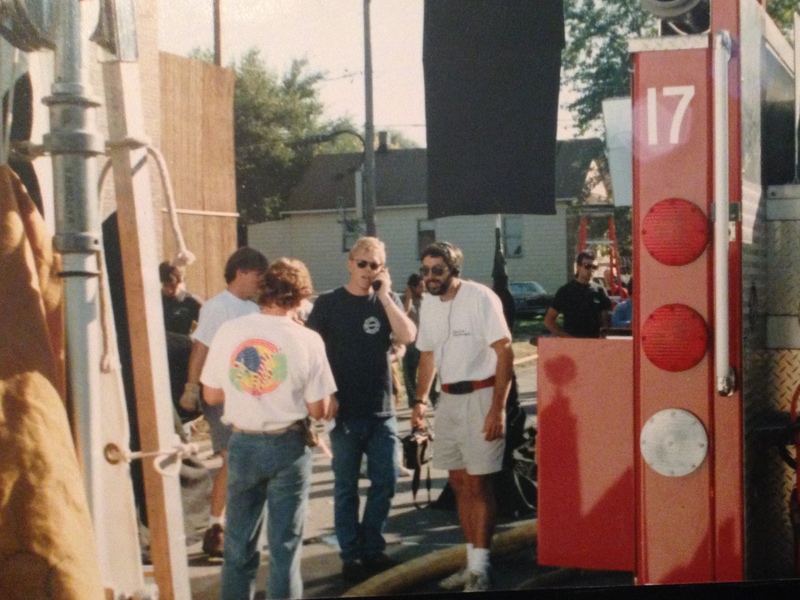 On set, Backdraft. Standing next to 2nd Unit Director and Executive Producer, Todd Holland. As fate and luck would have it, I got an education in the field from many different Directors who taught me in different ways. You could not buy the experience today at any cost. That’s Alicia Accardo, script supervisor and Art Seidel, our lovely UPM, with Director Vern Gillum, DP Robert Hudecek and me. Totally forgot who the guy on the left was. Photo from Law & Order Criminal Intent. Vincent D’Onofrio as Det. Robert Goren and Katherine Erbe as Det. Alexandra Eames. Criminal Intent was basically Sherlock Holmes of the NYPD. Our lead actor played a very strange, very smart and very entertaining detective who always (almost) got his man. The structure of the show moved to an extensive final, climactic scene; we always called it the ‘aria’ –a last scene that ran 7-10 pages with our hero and the suspects leading to the reveal of the killer. The brilliant Rene’ Balcer, L&OCI’s original Showrunner, always created a structure that used one main set, or world we would inhabit, and that would be the same place we would stage the aria.